3. Deploy the mainnet upgrade , including upgrade package, upgrade steps, etc. 1. On August 9th, SEER officially launched "Gang Ge talkⅡ" with the theme "SER DAPP". Mr. Wu Gang, SEER China Investment Representative, introduced the ecological development status and annual plan of SEER and he answered some questions raised by the community. "Gang Ge talk" at 7:30 pm every Thursday in the SEER telegram Chinese community, welcome to participate in https://t.me/seerchain. Learn more details on "Gang Ge talkⅡ" . (2) Checking the setting of multi-signature to prevent the user from accidentally triggering the multi-signing of the loop, resulting in loss of account control. (3) Add the get_rooms_by_account interface, you can query the list of predicted rooms created under the account for DAPP. (4) Fixed some problems that occurred when users voted for board members. The Council will adopt a proposal to require all witnesses to switch to the new node software version before 8:00 am on August 15, 2018 Singapore time, and the unswitched Witness node will be offline. Please hurry up to update the Witnesses node! After this update, the threshold for users to create a predicted room through DAPP will be lower, clearing the obstacles for the "small high frequency" prediction mode. On August 5th, a SEER document site operated by a community developer was launched and it is still being improved: https://docs.seerchain.org. 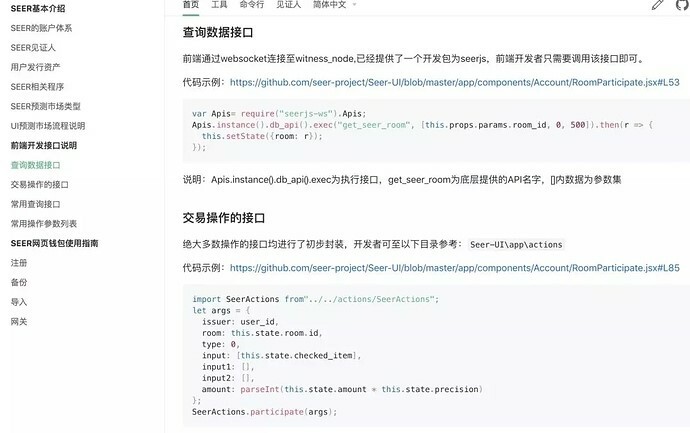 Through this website, community developers can easily understand the use of interfaces based on SEER development, development tools, and the meaning of return information when developing based on SEER. At present, more than ten DAPP project teams/community developers have joined the SEER developer community. welcome to start a project discussion, participate in discussions or seek technical aspects help in the SEER developer community: https://forum.seerchain.org. At present, SEER has established overseas expansion operations teams of more than 10 people in Beijing and Osaka, and SEER also established overseas communities such as English and Japanese, among which the number of English telegraph groups exceeds 10,000 members. (2) The SEER English team and India's well-known youtube media reached a preliminary cooperation intention, and plans to cooperate with the other side to develop the Indian community after the DAPP online. (3) On August 7th, the SEER English team released the 14th SEER Week Weekly Report and “Gang Ge talkⅠ“，etc. (4) In the developer forums such as bitcointalk and bitsharestalk, and the media platforms such as steemit, twitter, and medium, and other graphene projects. We discuss the concept and advantages of SEER with blockchain enthusiasts and developers all over the world, and we discuss the future of graphene blockchain technology to let more people know about SEER. (5) The SEER Japanese District Development and Operation Team translated the general content of “Gang Ge talkⅠ”, and communicated with SEER's Japanese community enthusiasts. (6) At present, the SEER English team is still working on the translation of "Gang Ge talkⅡ" and the introduction of the SEER English video. The SEER Chinese District Operations Development Team continued to conduct daily Q&A maintenance and technology promotion on the media/forum platform such as Bihu, Biask, 8BTC, and zdpvt etc., and answered questions in the telegram Chinese group. SEER recently plans to host some welfare-themed activities for community enthusiasts, participants also can get SEER souvenirs. 6. octopaul second airdrop for SEER will be issued on August 25.